Product #16510 | SKU MK055XPRO3-BHQ2 | 0.0 (no ratings yet) Thanks for your rating! The MK055XPRO3-BHQ2 Aluminium Tripod from Manfrotto pairs the MT055XPRO3 aluminium tripod legs with the MHXPRO-BHQ2 XPRO Ball Head with a 200PL quick release clamp and plate. The tripod is a three-section support that has a load capacity of 8 kg and extends from 23 to 182 cm. Its legs are secured by Quick Power Locks, which are updated flip locks that increase the tripod's rigidity by 50%, and its load capacity by 2 kg over its predecessor. A redesigned centre column has a one-finger operation and includes an Easy Link attachment for attaching accessories such as an LED light or a reflector. The centre column can be positioned horizontally, allowing for low-angle and macro photography. The upper disc where a tripod head is mounted has been redesigned as well, and now has a bull's eye bubble level that rotates 360°, so you can locate it where you can see it. This allows you to level your camera on both the horizontal and vertical planes. 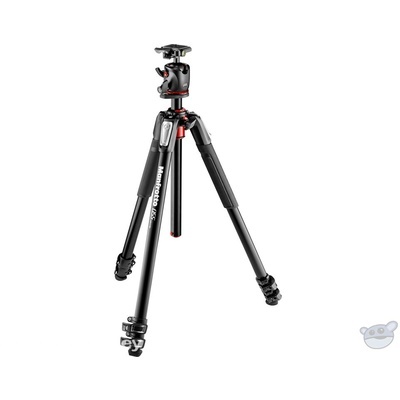 The Manfrotto MT055XPRO3 Aluminium Tripod is a three-section support that replaces the 055XPROB tripod. It has a load capacity of 19.8 lb and extends from 9 to 170 cm. Its legs are secured by the Quick Power Locks. These updated flip locks increase the tripod's rigidity by 50%, and its load capacity by 2 kg over its predecessor. Accurately adjust your camera position with the MHXPRO-BHQ2 XPRO Ball Head with 200PL Quick-Release System from Manfrotto. Able to hold up to 10 kg, the 0.5 kg ball head is strong enough for most applications and ideally suited for an equally sturdy tripod. The XPRO lets you fine-tune your adjustments, thanks to separate knobs for both the ball and the 360° panning as well as a friction control knob for more exacting placement.